MEA is a designation given to the region of the world made up of the Middle East and Africa. This designation is typically a term used by companies, organizations, and corporations. The designation can be used for miscellaneous marketing, distribution and customer support services. In this article we have compiled a comprehensive list of countries in this region. In addition to the list of countries, we have assembled other unique information about the region. This data and information is categorized below, starting with the background of the region broken in to the Middle Eastern states and then Africa. It is important to note that while the countries in the MEA region have much in common; MEA also has a great deal of attributes that are distinctive country to country. MEA countries also share the same block of time zones making trade and business dealings simpler. The Middle East refers to the region of the world around the southern and eastern edges of the Mediterranean Sea extending throughout the Arabian Peninsula and Iran. It is an area considered to be the birthplace of some of the world’s oldest religions including Christianity, Islam and Judaism. The Middle East is crucial to world affairs not just because of its strategic geographical location but because emerging markets growing exponentially. 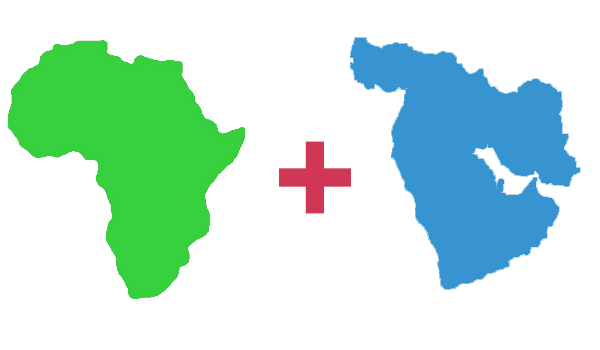 Africa is the second largest continent on Earth. With over 1.1 billion inhabitants, Africans account for one/sixth of the world’s total population. Islam first spread into Africa in 639 A.D. and remains the largest followed religion on the continent. The second most followed religion is Christianity. Geographically it shares the Mediterranean Sea, Red Sea and the Suez Canal with its other half in the MEA, the Middle East. The MEA is home to a number of languages, one of most widely used being Arabic. Arabic is spoken in the Levant; Syria, Lebanon, Palestine and Jordan as well as the Gulf States; Saudi Arabia, United Arab Emirates, Qatar, Bahrain, Oman, Yemen, Iraq and Kuwait. The Gulf States all speak the closest form of Arabic to MSA. MSA is the abbreviation used for Modern Standard Arabic, known as fusha in Arabic. It is the form of Arabic used in professional and academic settings; however dialectal Arabic (that differs country to country) is used in everyday life, known as ammiya. Arabic is also spoken by over 170 million people in Africa. English is prevalent throughout the entire MEA region. Other common languages used are Hebrew and French (throughout the Levant and Northern Africa) Farsi, Turkish, Swahili, Berber, Hausa, Portuguese, Spanish, Setswana, Kirundi, Tigrinya, and Amharic. South Africa alone has 11 official languages. The region is one of the most youthful in the world with Oman, Iraq, Yemen, Syria, Jordan, and the Palestinian Occupied Territories all having over 50% of their populations under the age of 24. In regards to social media, Arabic is one of the fastest growing languages used on Twitter. Since May 2013, usage of Facebook has grown by 49%, Twitter by 54%, and LinkedIn by 79%. This massive expansion of social media in the Middle East could be linked to the fact that it is one of the youngest regions in the world. Listed below is the percentage of the population under age 24. For the African states, of the 47 countries and 6 islands (counted for our purposes as countries) the percentage of youth as a part of the total population is even higher. 35 African states have over 60% of their population under the age of 24. This age demographic as well as the growing middle class in Africa has created a huge surge in social media usage. That social media usage is becoming more and more accessible due in part, to cheaper smartphones available now. These common threads throughout the MEA region is causing companies to not only take a closer look at the region but pool more resources to focus on growing interest there. Because of this, creative marketing in multiple arenas and languages is essential to reach this new assortment of consumers.